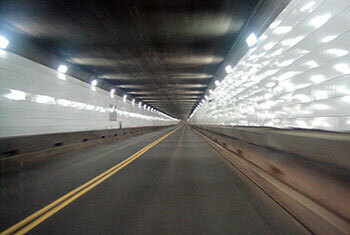 The Detroit-Canada Tunnel is an underwater highway tunnel connecting Detroit, Michigan and Windsor, Ontario. The tunnel, construction of which ended in 1930, cost 23 million dollars to complete. It has been recognized as the world’s only underwater international border crossing for automotives. The tunnel is also the second busiest border crossing between the United States and Canada. The construction of the Detroit- Canada Tunnel, which had been a topic of discussion between the United States and Canada since the 1860s, officially began in 1928, though some previous- and unsuccessful – attempts at its construction had been made in the past. One such attempt was made in 1871; however, the project was abandoned due to a sulphur gas leak that led to widespread illness among the workers and resulted in the deaths of two. Parsons, Klapp, Brinkerhoff, and Douglas, an architectural firm based out of New York, was responsible for the tunnel’s construction in 1928. Several building methods were used, including the “trench and tube” method. The first step was to create a trench on the river bottom. Cylinders were then placed in this trench, and the various pieces of the tunnel were connected with one another. The tunnel took approximately 26 months to complete. The mayors of Windsor (Cecil E. Jackson) and Detroit (Frank Murphy) both gave speeches at the Tunnel’s opening ceremonies, which took place on November 1, 1930. The tunnel began to accommodate traffic on November 3, 1930. Though traffic through the tunnel was initially low, this increased throughout the 1950s and 1960s with the growth of the downtown areas in Windsor and Detroit. In terms of the tunnel’s ownership, it was originally proposed that Detroit and Windsor were to own their respective sides of the tunnel after 60 years of its operation. However, in the mid-1980s, the Detroit-Canada Tunnel Corporation argued that the tunnel would be run more effectively under one organization as opposed to two. The City of Windsor then launched a court battle and, by the end of the 1980s, won ownership of the Canadian portion of the tunnel. Barkholz, D. (1994). Tunnel fears lost traffic. Crain’s Detroit Business, 10(48), 1. Detroit River Tunnel Partnership. (2002). The Windsor-Detroit Tradeway Proposal. Windsor, Ont: The Partnership. Detroit-Windsor Tunnel. (2017). Detroit-Windsor Tunnel. Fight at the end of the tunnel: Windsor seeks better deal on border crossing. (1987, May 26). The Gazette. McCormick Rankin Corporation. (2010). Improvements to the Canadian Plaza of the Windsor-Detroit Tunnel Master Plan and Environmental Assessment Study: Environmental Study Report. Mississauga, Ont. : McCormick Rankin. Williamson, Doug. (1987, Dec 05). Tunnel the prize in bitter fight. The Windsor Star. Windsor Public Library. (2001). The Fleetway: An Exhibit of the Windsor-Detroit Tunnel. Virtual Museum.